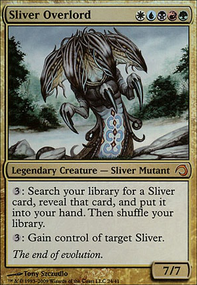 Full credit for this build goes to the deck: A Sliver Deck With No Slivers?!!. It popped up in the cycle list and I instantly loved it. 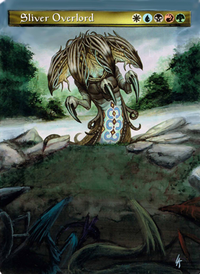 I have always liked changelings, I find that cards like Taurean Mauler , Crib Swap , Changeling Titan and Cairn Wanderer make it into a lot of my first drafts of decks. They then often get cut for one reason or another. This is an early build, on paper only.. When i order the cards the lands might end up changing. If i dont have them in my collection I might not put out $25 for a single dual land. Also just from playtesting on this site I am finding that card draw might be a problem. I have tried to compensate by adding a bunch of mana rocks but need to test for real before I will know what is missing.